We believe that part of establishing breakthrough and transformation is to unite the generations in sustained prayer partnered with strategic prayer. At the same time believers are being trained to establish and maintain beachheads in their region through understanding the that the Lord has called us to be in our sphere of infulence. We believe in equipping and mobilizing the body of Christ to see the Kingdom of God advance! Check out the video to see highlights from our first 10 years of ministry! Like his great, great, great grandmother, Maria Woodworth Etter, Jack is passionate to see the Son of God manifested, that he might destroy the works of the devil. (1Jn.3:8). Jack has over 20 years of ministry experience in various roles including itinerant speaking, teaching, deliverance and prayer ministry. 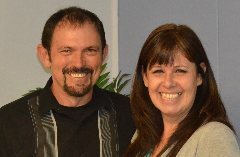 Jack, along with his wife Deborah lead LTF Ministries and serve on the International Apostolic Council and as Arizona State Leaders for SPAN (Strategic Prayer Apostolic Network), an international prayer network led by Rebecca Greenwood of Christian Harvest International. Deborah is the Founder of LTF Ministries. She is devoted to mobilizing and equipping the Body of Christ to engage in an intimate, fiery relationship with the Lord. Together they network with intercessors to pray strategically for local, national and global concerns. Deborah is a published author and speaks, teaches and leads prayer assignments both nationally and internationally. She has also earned her Doctorate in Biblical Leadership through Ascend International University and Doctorate Diploma in Practical Ministry from Wagner Leadership Institute. Both Jack and Deborah are commissioned by Global Spheres International, Corinth TX and Christian Harvest Apostolic Network, Colorado Springs, CO. They are both licensed and ordained ministers of the Gospel.